Larry Garner – Baton Rouge bluesman who’s emerged over the past decade as one of the most original composers in the genre. He recorded two discs for JSP, Double Dues and Too Blues, two discs for Verve/Gitanes. You Need To Live A Little and Baton Rouge (currently available on Evidence), and a trio from Ruf Records, Standing Room Only, Once Upon the Blues, Embarrassment to The Blues (a live recording), Here Today Gone Tomorrow, and the latest, Live At the Trivoli with Norman Beaker, will be out this spring. 1. Okay….you had heart surgery a while back….how are you doing? So far so good. I didn’t know how bad I was feeling until I started feeling good again. 2. So far, you’ve released seven studio albums, plus a live disc. Unfortunately, your latest release (Here Today, Gone Tomorrow) is hard to track down in the U.S. Any chance we’ll get to see it released domestically in the near future? Right now I really don’t know. But we have done another live CD in England with the Norman Beaker Band that will be out this spring. 3. You worked for Dow Chemical in Baton Rouge before striking out into the music business. How long did it take you to realize that music was what you wanted to do full time? I always wanted to play music and that’s what I did until I went into the military. I even played on every base I went to while in the military and Dow Chemical would have never been in my life if it had not been for disco music. When I got out of the service the clubs had started getting rid of the stages and putting in the mirror balls so there was really no avenue that I knew of to play live anymore other than gospel. I started riding Harleys going to college and working at Dow. 4. Who are your biggest influences as a composer? I like Curtis Mayfield and Bob Dylan. The Road of Life, Miracles of Time, Doghouse Blues, Where Blues Turn Black, Heavy Pieces, No Free Rides, High on Music, Had to Quit Drinking, Jook Joint Woman. 6. Who are your biggest influences as a musician? As a guitar player it would be my uncle George Lathers, Rudy Richard, Gatemouth Brown and my cousin Joe Louis Thomas. 7. What was the worst gig you’ve ever done? A gig in San Destin where they didn’t honor the contract and one other in Kalispell, Mt. 8. What is the best and worst part about being a bluesman? The best part for me is that I love to travel and the blues have afforded me places and cultures I never would have experienced otherwise. I guess the worst part is the scarcity of good work here and having to be the underdog when you are not in with the cliques. 10. What does your record collection look like? A little of this and a little of that. I probably have about 300 cds and the same in vinyl. 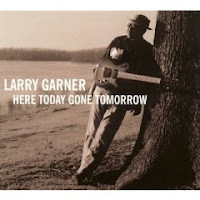 Here's a clip that sums up Larry Garner perfectly, great songs (in this case, "Keep On Singin' The Blues"), great musicianship, great rapport with his audience (check out the monologue about halfway through).....just a guaranteed good time. Hard to believe that it's been over a dozen years since Luther Allison passed away. He was one of those guys that you thought would be around forever. The video below was taken from German TV around 1994, about the time that his "comeback" disc, Soul Fixin' Man, was released in the U.S. I put "comeback" in quotes because in reality, Allison had never been away from the scene. He had relocated to Europe in the late 70's and built a large and enthusiastic following there. He never stopped performing or recorded, releasing albums overseas with regularity, but it was just hard to get his music over here in the pre-internet days. Fortunately, Alligator picked that one up for domestic release, along with his subsequent ones and the floodgates were opened. "I Want To Know" is from Soul Fixin' Man. Prior to leaving the states, Allison was one of the few blues artists with Motown. Even though his Motown albums came and went with little fanfare in the 70's, two of them (Bad News Is Coming and Luther's Blues) were reissued after Allison's death. Listening to them now, they compare favorably to what Allison was doing on his final records with Alligator over twenty years later. It makes you wonder what things might have been like had Allison stayed in the U.S. Traditionally, fans in Europe have been more receptive to blues artists and their music than we have in America, so if he had stuck around, he may not have even gotten to the point he did before he died....or maybe he wouldn't have had the opportunity for his music to grow and develop as it did had he stayed here and received less fanfare and adoration. It makes you wonder......it's just too bad we basically missed out on Luther Allison over here for fifteen years or so and almost didn't get him back at all. Yesterday (2/25), the state of Mississippi honored David "Honeyboy" Edwards with a Lifetime Achievement Award at the annual Governor's Awards for Excellence in the Arts. What a life it's been for Edwards! Now 94 years young, he is one of the last living links to the Mississippi Delta Blues scene of the 30's and 40's. He traveled with Robert Johnson and was present the night Johnson was poisoned around Greenwood. His autobiography, The World Don't Owe Me Nothing, is essential reading for blues fans, and he's still traveling and playing the blues like a man 30 years younger. This video is from September of 2009, when Edwards appeared at Sheffield's Boardwalk in the U.K. Shoot That Thang!!!!! Wrapping things up today is the one, the only Super Chikan. This video is from a recent episode of Mississippi Roads, a local show on Mississippi's public TV channel. It's a nice profile of one of the most original characters on the Mississippi Blues scene. If you haven't experienced Super Chikan, you need to put him at the top of your "To Do" list. Check out his website. Welcome to the first "official" installment of Friday Blues Fix. Check it out and let me know what you think. 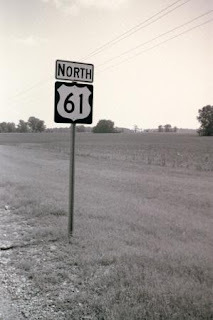 Since I'm still trying to figure out how to do audio, let's look at a video I found on YouTube of Otis Rush performing one of his classics, "So Many Roads." Rush was one of the first blues artists I discovered when I started listening to the blues, and he's still one of my favorites. I even made the trip up to Philadelphia, MS a couple years ago when his Blues Marker was dedicated just to see him in person. It was a very nice ceremony and he seemed to be truly honored that his hometown area (he was born in nearby Neshoba) would remember him. Sadly, he hasn't fully recovered from a stroke he suffered several years ago and is no longer playing, but he has some great recordings out there that deserve to be heard. Enjoy! 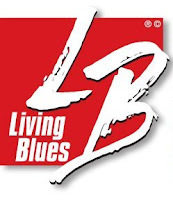 Living Blues Magazine is celebrating its 40th year of publication in 2010. As part of their celebration, they will feature a different decade each issue, culminating in an issue that will catch up with many of the artists featured over the magazine's existence....sort of a "Where Are They Now" issue. The latest issue (#205, John Primer on the cover) features the decade of the 70's, and there are lots of interesting pictures and a pair of lists that should pique interest. One list highlights 30 of the best blues albums of the 70's and the other highlights 30 that you might have missed. Let the debate begin. The February/March issue of Blues Bytes should be up by this weekend. 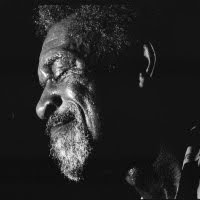 One of the new releases reviewed is a great CD/DVD release by Luther Allison from Ruf Records. It's a recording of one of his last performances, in Montreal, given just days before he received his terminal cancer diagnosis. If you're a fan, you'll want to own it. If not, buy it anyway and you'll become a fan, guaranteed. Also look for a review of the new Nighthawks' CD, a live unplugged effort recorded for XM Radio, and a Flashback review of one of my all time favorite albums. Sad news this week.....Mississippi bluesman David "Lil' Dave" Thompson was killed in an auto accident in Georgia while returning to his hometown of Greenville from a gig in South Carolina on Sunday morning. I've seen several different ages listed so far, but his website indicates that he was 40 years old. Thompson joined Booba Barnes' band as a 15 year old (appearing with Barnes in the movie Deep Blues), and recorded with David Malone (now David Kimbrough, son of Junior Kimbrough) for Fat Possum in the early 90's. He also released several discs of his own from 1995's Little Dave & Big Love to 2008's Deep In The Night. From all accounts, he was a really nice guy with plenty of great things still ahead of him. Hi. Welcome to my new blog. Since this is not only my new blog, but also my first blog, please bear with me for awhile until I get the hang of it. My goal is to post once a week, on Fridays, with some sort of info about the blues. Hopefully, it will be an assortment of clips, stories, articles, pictures, and anything else I can figure out how to use. I've been listening to the blues for over twenty years, since I was in college. About ten or eleven years ago, I started contributing CD reviews to an internet site called Blues Bytes. It won a Keeping the Blues Alive (KBA) award a couple of years back for best internet site. It's a really cool site, and the reviews are contributed by listeners from all over the world. Check it out sometime, if you haven't already. Friday Blues Fix was originally an email that I sent out to co-workers once a week on, you guessed it, Fridays. I would discuss a particular artist and attach a song. It seemed to catch on pretty well, so it was suggested to me that I start a blog, so I thought why not. Anyway, that's FBF in a nutshell. Hope you'll stay tuned and make it part of your weekly schedule. I'll do the best I can to make it worth your while. See you Friday.